Bulgaria develops Danube cycle route. A new project will develop the trans-border tourism along the Danube river in Bulgaria. 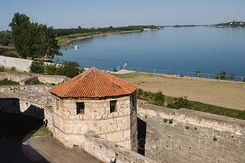 “The Danube cycle route” was presented in Vidin city. The project is estimated to cost 285 540 Euro, and most of the funds will be supplied by the European fund for regional development. The project will be executed during the next 18 months. The main goals are popularization of tourism activities from Budapest to the Black sea. Tourists choosing the route will have the chance to participate in festivals, culinary holidays, and other events, traditional for the local regions.